It was about 2:00 am one night in March of 2015, recalls Xinglong Wang, when he looked at the data on the ALS mice. His team had crossed SOD1-G93A ALS model mice with mice overexpressing the mitochondrial-fusion protein mitofusin 2 (Mfn2), in the hopes of protecting neurons. To his disappointment, the offspring did not live longer than typical ALS mice did. But he noticed something startling. The Mfn2 ALS mice, at end-stage, had muscles that were about twice the weight of their parents’ muscles. “It’s unbelievable,” Wang thought. “The most significant phenotype of ALS is muscle atrophy.” He and his lab at Case Western Reserve University in Cleveland, had stumbled onto another job for Mfn2: protecting axons and muscles, though not neuron cell bodies. Their findings, reported in July in Cell Metabolism (Wang et al., 2018), suggest that boosting mitofusin 2 quantities or activity might help people with ALS hold onto muscle function—and thus quality of life—longer. Conveniently, the authors of an April study in Science have some small-molecule Mfn2 activators that might be worth a try (Rocha et al., 2018). Those researchers, at Washington University in St. Louis in Missouri, are aiming first at a neuromuscular disease directly linked with Mfn2 mutations, Charcot-Marie-Tooth disease (CMT) type 2A. At least in a dish, these compounds reversed mitochondrial defects in neurons characteristic of the disease. The failure to maintain or transport mitochondria is a common theme among neurodegenerative diseases, explained Justin Fallon of Brown University in Providence, Rhode Island, who was not involved in either study. 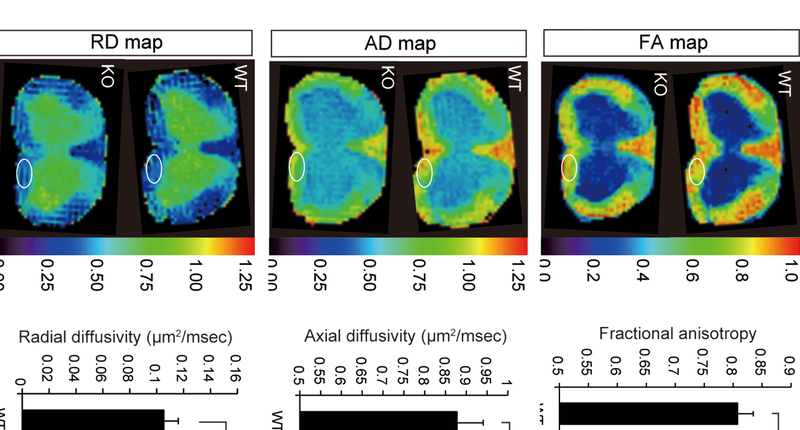 In fact, Mfn2 deficiency has been implicated in Alzheimer’s, Huntington’s, Parkinson’s and ALS (Wang et al., 2009; Shirendeb et al., 2011; Tang et al., 2015; Palomo et al., 2018). “I think that the potential is real for having an impact in several neurodegenerative diseases,” said Fallon. Indeed, defects in mitochondria were among of the first changes scientists spotted in motor neurons in people with ALS (Atsumi, 1981; for review, see Smith et al., 2017). These powerhouse organelles ride microtubule rails to axon tips, where motor neurons meet muscle. Dissolution of the neuromuscular junction (NMJ), and the consequent dying back of axons, is thought by many scientists to be an early event in ALS pathology (see Feb 2018 news). “In terms of ALS, and the motor neuron, anything you can do to preserve the synapse is likely to have benefit,” said Fallon. Wang knew that mitochondria break apart in ALS, and that mitochondrial dysfunction makes neurons vulnerable to stress. That’s why he suspected increasing levels of the mitochondrial fusion regulator mitofusin2 could help protect motor neurons in ALS. To test the idea, his team crossed SOD1-G93A ALS model mice with a line that specifically overexpresses Mfn2 in neurons. SOD1-G93A mice tend to get sick around two months of age. By four months, they lose weight and muscle mass, and struggle to walk. The offspring, however, with increased levels of Mfn2, developed their first symptoms two months later than their parents, maintaining weight and mobility through four months. Looking under the microscope, the researchers found that these double-transgenic mice maintained nearly intact NMJs right up to end stage. The mitochondria in their motor neurons were longer in the cell bodies and the parts of neurites close to the cell bodies. However, at the very tips of axons, by the NMJs, the mitochondria remained fragmented. Wang suspected that Mfn2 has some other function that helped keep motor neurons and muscle cells connected. His team discovered a clue in the high levels of the protease inhibitor calpastatin at NMJs in Mfn2-overexpressing ALS model mice. And, when they depleted the mitofusin 2 gene in wild-type mice, neural cell bodies contained calpastatin, but their neurites didn’t. Calpastatin, encoded by the CAST gene, is one half of a proteolysis system. It inhibits calpain, an apoptosis-promoting protease activated by calcium ions in injured muscle cells and neurons. And, localized depletion of calpastatin following injury drives axonal loss (Yang et al., 2013). Calpain regulation is also important for acetylcholine receptors to cluster in NMJs – a key step in building connections between muscle cells and motor neurons (Chen et al., 2007). Moreover, overactivation of calpains, particularly type 1, is increasingly implicated in diseases including ALS and muscular dystrophy, where it potentially contributes to muscle, neuronal and axonal loss (Saito et al., 1993; Stifanese et al., 2014). Under pathological conditions, calpain can promote excitotoxicity and neuronal loss (Tanako et al., 2005; Ma et al., 2013; Ma et al., 2012). Moreover, the over-expression of calpastatin in SOD1-G93A mice is protective, leading some scientists to propose this approach as a treatment strategy for the disease (Rao et al., 2016). 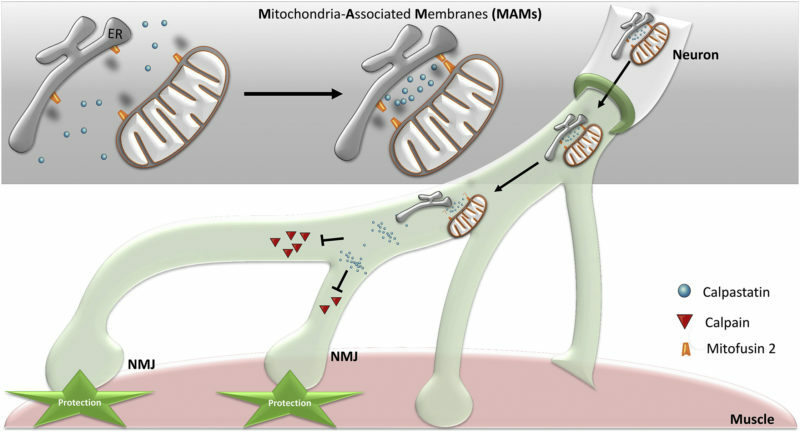 Wang and colleagues hypothesized that Mfn2 might deliver calpastatin to the NMJ, helping to maintain muscle and motor neuron connections. In fact, when they co-stained mitochondria and calpastatin in cultured mouse cortical neurons, they saw that calpastatin spots decorated mitochondria trundling along axons, suggesting that calpastatin was hitching a ride to nerve terminals. And when they blocked mitochondrial transport, calpastatin was stranded, too. How does Mfn2 mediate this co-trafficking? When the scientists fractionated mouse spinal cords, they found calpastatin associated with mitochondrial-associated membranes called MAMs (Nov 2016 news; Jun 2014 news, Stoica et al., 2014). These membranes, held onto mitochondria by mitofusin 2, are thought to link these powerhouses with the endoplasmic reticulum. 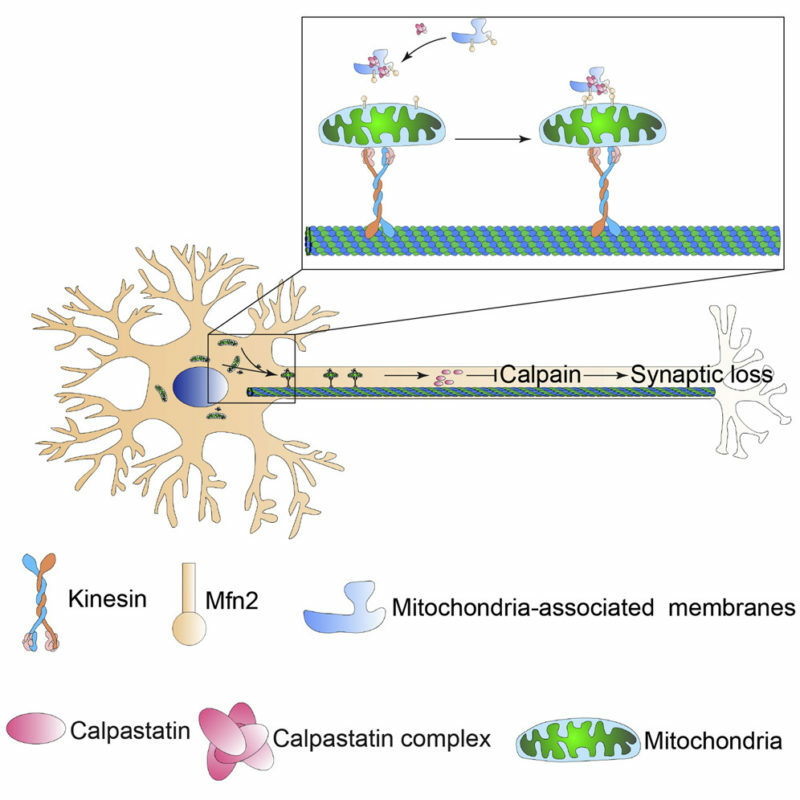 The researchers hypothesized that calpastatin climbs on board MAMs, which are tethered to traveling mitochondria by Mfn2, to reach nerve terminals. Increasing Mfn2 levels would thereby enhance this trafficking, providing calpastatin to the NMJs, where it presumably deactivated calpain and protected the synapses. Supporting their model, the authors found that a Mfn2 mutant unable to link the mitochondria to the ER did not help transport calpistatin in cultured neurons. They also tried eliminating calpastatin in the mSOD1-Mfn2 mice, and found it abolished the protective effects of Mfn2. Together, the results suggest that increasing levels of mitofusin 2 may be of benefit in ALS, at least in part, by helping to maintain neuromuscular junctions and keep muscles moving. Researchers at Washington University might have just such a treatment on their hands—or at least the starting point for developing one. They’re interested in a neuromuscular disorder, Charcot-Marie-Tooth disease 2A, that occurs due to the inability to activate Mfn2. The mitofusin 2 protein works rather like a safety pin, explained Gerald Dorn, leader of the team. When it’s open, it’s ready to act. But when it’s closed, it becomes locked and inactive. Previously, Dorn’s team developed small peptides that could nudge Mfn2 into an open shape (Franco et al., 2016). In their new study, they developed small molecules that could do the same job. “That’s a big step,” said Fallon, noting that small molecules are preferable as medications. Small molecules could, in theory, be taken by mouth and are usually more stable than peptides in circulation. Mitochondria in mitofusin-deficient cells are fragmented, depolarized, and clumped, and don’t move properly. The treatment reversed these defects in vitro. 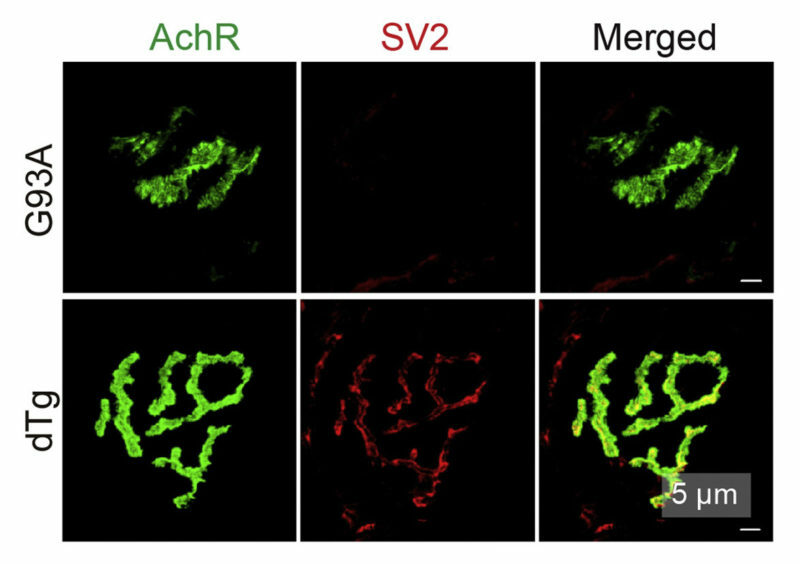 It also restored mitochondrial trafficking along axons in sciatic nerves from CMT2A model mice. Could Dorn’s Mfn2 activators also be of benefit in ALS? “The answer is maybe,” said Dorn. The researchers aren’t certain if the loading of calpastatin on mitochondria is activated by the same Mfn2 active site targeted by the small molecules. In fact, a Mfn2 variant unable to regulate mitochondrial dynamics was still able to recruit calpastatin in Wang’s experiments, suggesting that the protein mediates mitochondrial fusion and calpastatin loading via different mechanisms. “But it’s a hopeful maybe,” Dorn added. “Better mitochondria are a better deal.” Mitofusins help mitochondria produce energy in neurons, because they promote fusion and motility, he said, which would presumably be beneficial in any neurodegenerative condition. Both ALS and CMT would be sensible diseases for early trials of mitofusin 2 activators, added Fallon. But before that can happen, Dorn’s team has some work left to do. The original molecules his group developed are not stable enough to try in animals, and the researchers will need to ensure the compounds enter the nervous system, he said. The group is working on next-generation versions, and is already in conversations with companies interested in the approach. And, based on Wang’s results, this strategy could potentially help keep muscle cells and motor neurons connected in ALS. Such a drug would be one of several approaches being pursued for ALS to stabilize these NMJs. For example, researchers in Canada launched a clinical trial focusing on an antipsychotic, pimozide, that showed promise in a small clinical study (Feb 2018 news; Patten et al., 2017). Meanwhile, scientists at New York University are working with Genentech in San Francisco to develop antibodies that activate the muscle enzyme MuSK, which forms and maintains NMJs (Feb 2018 news; Cantor et al., 2018; Pérez-García and Burden, 2012). And, at Tivorsan Pharmaceuticals in Providence, which Fallon co-founded, researchers are developing the muscle matrix protein biglycan (specifically, a derivative called TVN-102), which is also thought to stabilize NMJs by increasing MuSK activation (Armenta et al., 2011; Young and Fallon, 2012). The company is first targeting muscular dystrophy.